The 2009 D Jefferson Nickels from bank rolls are very rough (a lot of chatter on the surfaces). See the image for more details. 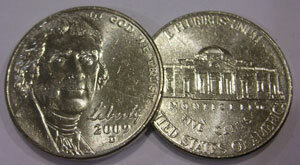 All these Jefferson Nickels are bright white, no toning, and are hand picked for eye appeal.